The Ministry of Works then began to take proper notice of Vientiane. 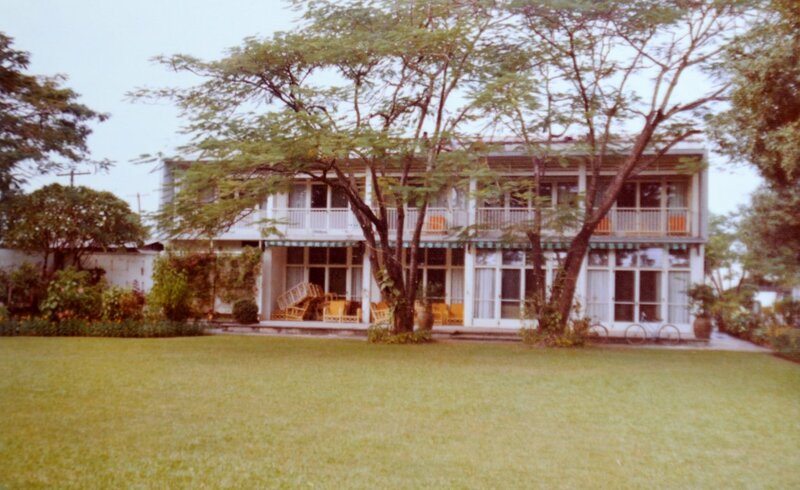 First, a 0.3 hectare site, called the Thao Teng site, was leased for 50 years from 1957 at Rue Pandit J Nehru with the intention of building embassy offices on it in due course. 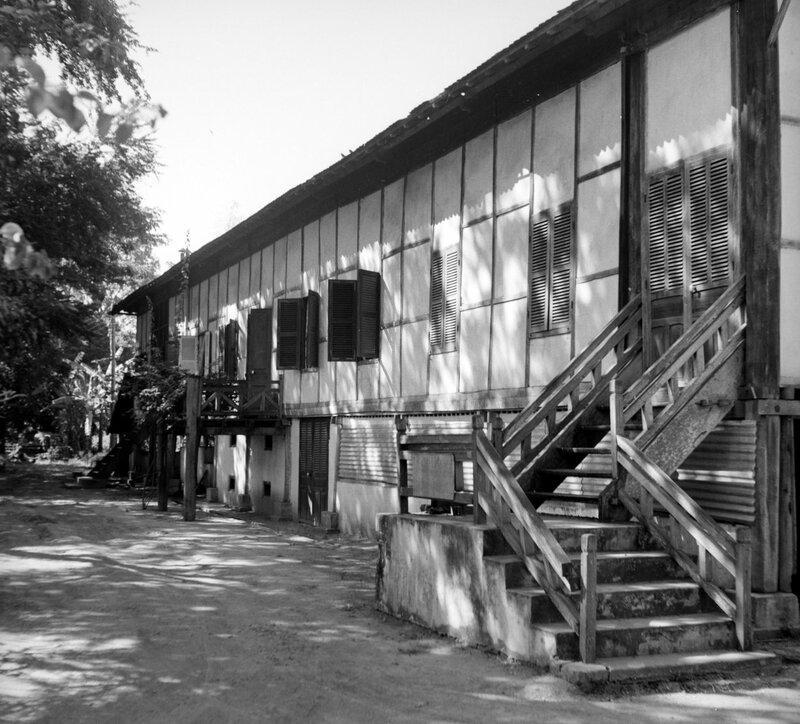 Second, in 1958, an adjacent site, Plot 796 Phong Xay Quarter, of 0.45 hectare was bought on which to build a residence, and a two-storey small ambassadorial residence to an in-house design was completed here in 1960. Third, and concurrently, two more bungalows were built at the MIC site (which had also been extended in 1957 by the purchase for £830 of about 40 more metres of road frontage). Fighting throughout most of the next decade precluded further physical construction, but some useful land acquisition continued. 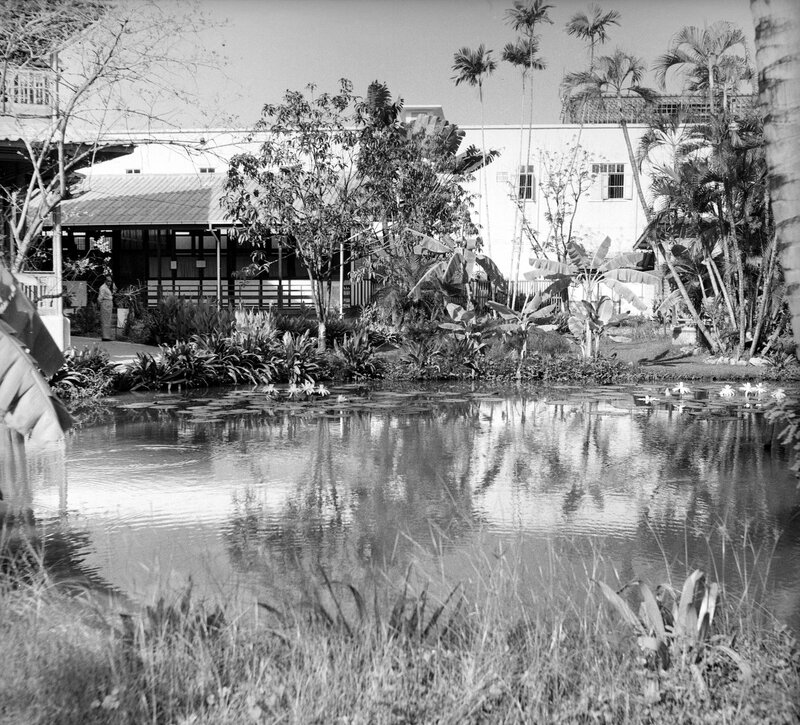 A small site opposite the still-undeveloped office site was bought in 1964 for a future staff bungalow. 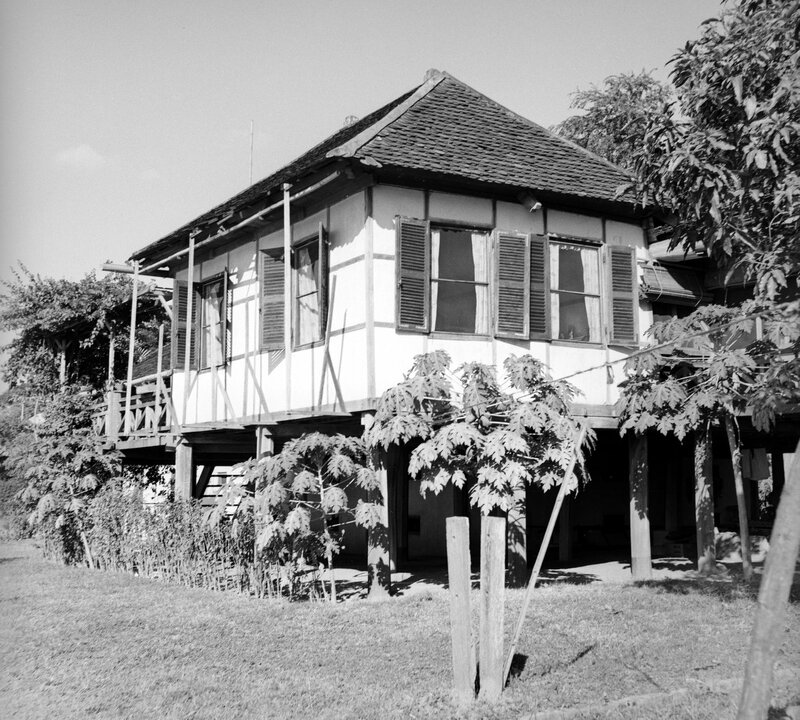 And, in 1968, two sites adjoining the residence and office sites were leased to enable a swimming pool and a tennis court to be included in the office plans being slowly drawn up in London. All leases were negotiated to be co-terminous in 2007. 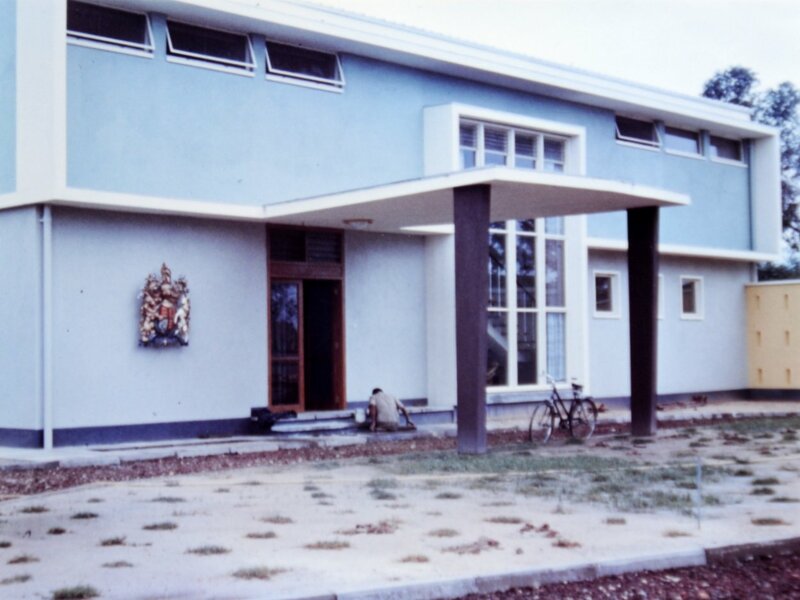 Construction of the single-storey offices, the staff amenities and the two-storey staff house opposite the offices was finally achieved in the late 1960s by direct labour under the supervision of a senior clerk of works, William Silcock. On completion, Vientiane was, at long last, well accommodated for a difficult small Post. 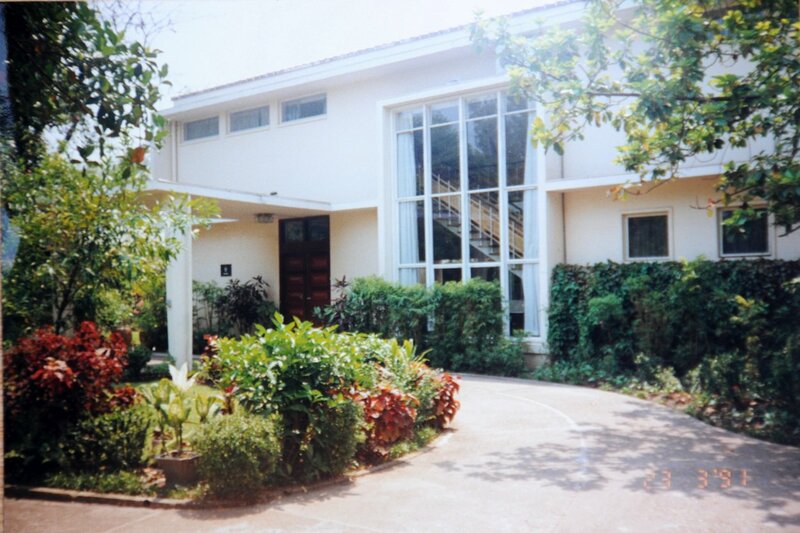 Garden front of residence, 1991. 1956 photo: Voravong or MIC?